When I first entered the working world, one of the first things I wanted to do was get a credit card. For me, it was like an affirmation of my status as a working person. It said that I’m now an adult with more money to spend than I earn! I could spend now and pay later! Many adult years down the road now, I’ve pared down my credit cards to just a couple (mostly due to the service tax) and other than some monthly charges I have on it, I hardly use my credit card anymore, and I find it liberating! So my money tip of the day is to control your spending by using cash, not card. My personal reason is thus : I don’t like charging lots of small expenses to my credit card and at the end of the month, receive a large bill. Without realizing it, small expenses do add up, and they are like a snowball rolling down a hill. It really grows without you realizing it! I now use cash when I pump petrol (also for security reasons), when I do my grocery shopping, or at restaurants (unless they offer attractive discounts when payment is made by card) In general, I pay by cash where possible whenever I make purchases under RM200. I also pay my utility bills by online bank transfers instead of using the auto-debit feature on credit cards. This gives me more control over the amounts I pay and to ensure I can check and if necessary, dispute any bills before payment is made. Using the auto-debit feature, it’ll be all sorts of hell trying to claim a refund from the bank or the utility company. I do realize that when you use your credit card, you accumulate reward points. Most credit cards offer you that. However, over the years, I’ve learnt that these “reward points” do not translate in anything except some crummy electrical goods which hardly even cost much these days, or paltry sums of cash vouchers. I used to use the points to offset annual fees but these days, most banks are happy to waive your annual fees if you use your card regularly i.e. at least once a month. By not using my credit card often, I have more control over my funds and I do not get a heart attack when my statement arrives. Rarely do you now hear the anguished cry of “What?! My credit card bill is so high! What did I buy? !” emanating from my lips. I also find it easier to budget and when an emergency strikes e.g. a stone just hit my car windshield and caused it to crack, I know I have the spare funds to get it repaired, without having to live on bread and water next month. At least I’d know that whatever I’m spending now is money I already have instead of “virtual money” on the credit card. That’s money that exists ex potentia. I do still use my cards of course. I do not carry a lot of cash with me (again for security reasons) and sometimes, it just makes sense to purchase items with a credit card e.g. online purchases, large purchases, attractive discounts with cards or when travelling ! Are you an avid credit card user? Or do you find yourself using cash more than your credit card? Will you cut back on the use of your credit card or are you dependent on it? Your parents are starting you out right by making sure you pay off your credit card debts monthly 🙂 Using a debit card is a good idea – you only spend what you already have! It certainly sucked to hear of your experience. I will be sure to be keeping a closer eye on my credit card from now – who knows if it might happen to me too! Perhaps consider a debit card? My first credit card was actually in uni, when they freely gave those away to students back in the day. I don’t use credit cards as much here. As much as I can, I’ll use cash, unless it’s something over $100. You’re right, when charging small items to the credit card, it adds up to one big bill at the end of the month. Yep! When you have to run around looking for an ATM, it makes you think if you really want or need what it is you want to buy. Making sure you only spend a set amount helps keep us all out of debt! I do not own credit cards, although sometimes I wish to apply one (especially when I need to bring huge sum of cash for some purchases). But until now, I manage to survive by paying cash / online transfers. I use to feel embarrassed whenever people asked me “you don’t have credit card meh? !” but thank you for your post – I think I done well for myself! only problem with debit card is you need to know your balance, otherwise transaction won’t go through, a bit of a hassle, but hey, you are not spending future money and then cry when you can’t pay it back! you are right…credit cards can be dangerous sometimes. You are one inspiring babe… 🙂 Knowing that it is possible to buy nice stuff for myself sans the use of credit card is so liberating. I await for that day myself! 😛 And in the meantime, I have cut down on the use of my credit card and it sure helps to walk away from shopping malls! Yup! My personal limit is that I don’t spend on a big item what I have not already saved up for, so I don’t quite bust the budget. Ultimately, it is up to us how we want to handle the situation, or whether we are smart enough to realize that a credit card or a credit limit does not mean “free money” – you still have to pay back what you spent! I have a supp card that I know is scrutinised by the Hubby end of the month. Hehe. I use it mainly for the main grocery shopping bill. Other than that, I stick to cash. I don’t like not being able to see my spending. With cash, when you’ve run out, you stop spending. (Or go to nearest ATM) With the card, it’s always there in your purse so if you don’t control your spending, you just keep flashing the card. I was in queue once behind a lady who whipped out her platinum card or whatever to pay for a RM60 top. ??? Teehee… you latest purchase wasn’t even on the card 😉 I used to pay for groceries in Carrefour with my credit card – so I’m not gonna laugh at the lady. I didn’t have enough cash on me at the cashier but I felt silly somehow. Your piece here reminded me of my run-in with credit card allure. I felt like ‘Wow, I am a working adult and I can pay my bills with a credit card, so I will swipe!’ especially when I see those items on sale with c/c privileges. However, after reckless spending for a few months, I finally had enough and stored my card in a tight corner of the purse. I now use the card for emergency purposes and if only I made purchases above 250. Like you, I am now using cash to pay for stuff and while it may be troublesome to withdraw more frequently, at least I feel the pinch and it does help in curbing my spending. I’m actually kind of scared of credit cards with their service charges…and interest rates and the snow ball effect of debts + the interest rate. I do however have a “spending account” where in that account is only for the money I put aside for frivolous purchases ex: make up clothes shoes “toys” etc. I have a debit card just for this account. It’s safer that way. Actually there’s no need to be afraid of credit cards, so long as you have will power and know your limits. Credit cards in fact can be very useful to “roll over” your cash 🙂 But your system is a good one too. This way, you won’t overspend because you are limited by how much you can use from the account – kudos! ParisB: This got me intrigued – what do you mean by “rolling over” cash? Doriosity: How much do you put into your spending account? 😉 Care to share? i am proud to say i own no plastic! erm… except for 1 atm card. a lot of times i feel like i need to own a credit card (online purchases, book flights etc) but always come down to my senses and realised really, i don’t. spending with cash is sometimes a little inconvenient but it means i’m spending my own money, not the bank’s. will go get a debit card soon soon soon! too much cash very unsafe. My dad gave me one of his credit cards for a short period of time. And I must say, while it was really exciting to have a credit card (i.e. OMG I HAVE “THE” CREDIT CARD!) , to me it was really a lot of pressure as well. Because of my parents situation with credits cards (debt uuugh), to me I fear the credit card like it’s the walking loan shark itself! While it is convenient, I’m happy to spend cash =) And I apply to banks which to not have stand alone ATMS (example, Public Bank) cause being lazy, I’ll need to WALK to the next bank available….and it’s costs RM 1 for transaction fees!! See? Then the “money loving” side of me comes into debate and it’ll win as usual =) helps me control myself much better =) And my budget always comes from what’s left in my wallet =) Not bad eh? Good financial principles 🙂 But honestly, there’s nothing to fear from a credit card so long as you are aware of its restrictions and spending within limits – a credit card can be very useful too! Your post is so right! I used to be a big credit card user but now I’m using only my debit card! Works better that way in terms of control. At least you can see where your money’s going and you know when to stop. Yay to debit cards and cash! Nay to credit cards! A good article, Paris! I think I’m the odd one among most here. I’m a HUGE credit card spender, but I’m also proud to say that I never owe any debts. For me, swiping card = paying cash. I’m very careful on spending, only buying stuffs that I need instead of I want. I swipe my card whenever is possible just to collect extra points so that I can use the points to waive off the government tax. In addition, I’ll filed up every transaction record and keep track of money flows. 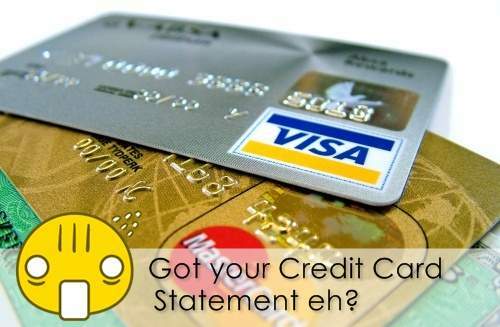 Use it smartly, credit card can be a useful tool to help in saving money (some cards has rebates on petrol and retails). But then again, it has to come along with the correct mindset and discipline. Sigh. I can’t help it….I use credit card to accumulate air miles. Avid debit card user! I hate borrowing money. But I also HATE that there are so few attractive offers using debit card. Like, no Treatpoints? WHAT?